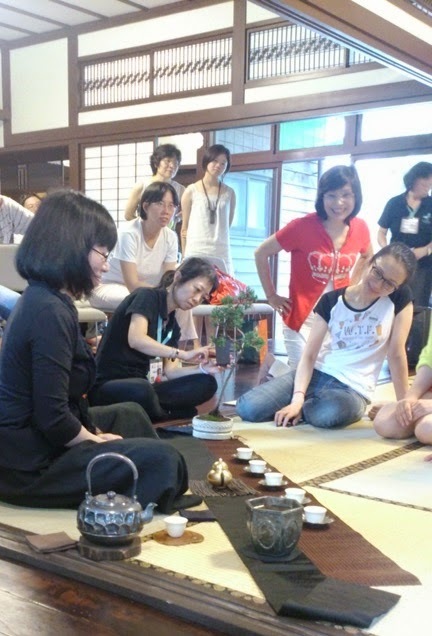 On Sunday June 1st, Teaparker and the association Cha Ren Ya Xin have performed 4 High Mountain Cha Xi at this historic site in Taipei: the Zhisheng Memorial in the Tatung University (on Chung Shan North Rd, Sec 3, No 40). 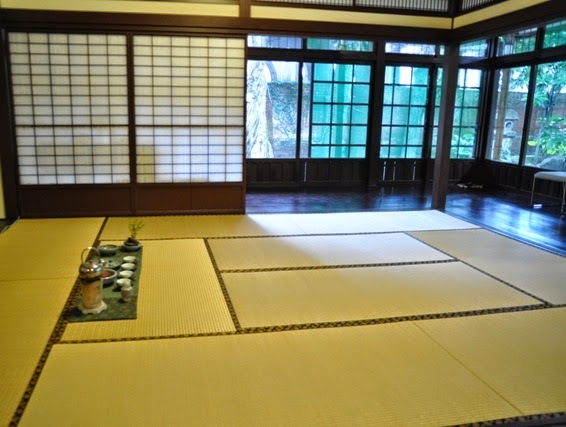 It's a house from the Japanese era (1895-1945) that belonged to the founder of Tatung (a local industrial company). 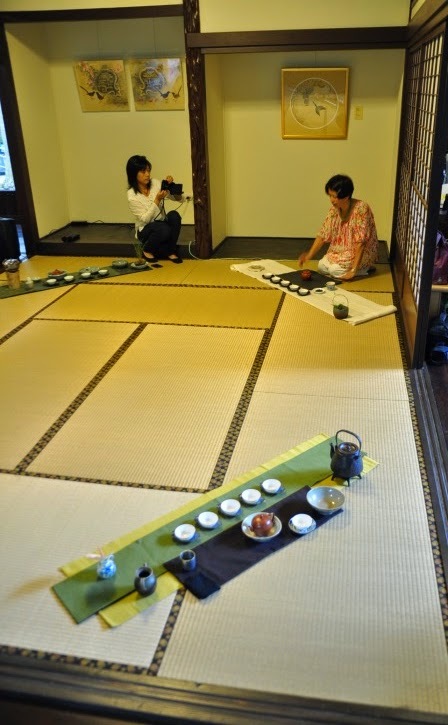 It shows how well the local Taiwanese elite adapted to the Japanese rule at that time. This place is such a natural fit for a Chaxi that I started to install mine before everybody else arrived. 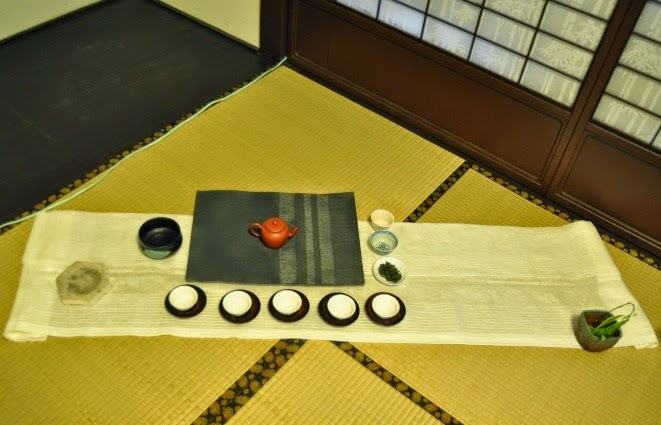 Looking at these pictures, I realize now that I instinctively faced the garden, whereas a Japanese tea ceremony would be oriented more towards inside! The other 3 students arrive and Teaparker assigns a corner for each of us. 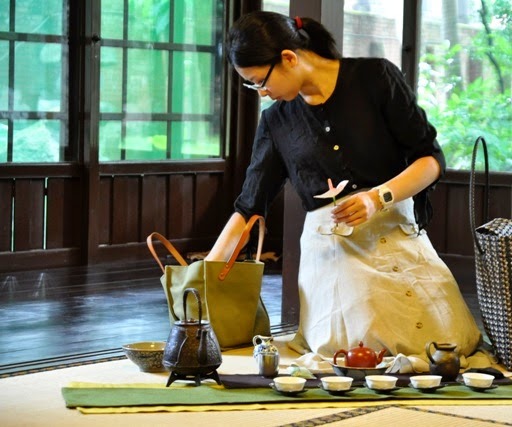 Ms. Chang YuFang also chose very green colors as background for her spring Oolong (from Qilai Mountain). This looks very elegant and fresh. The red zhuni teapot is at the center, in an ancient qinghua bowl. 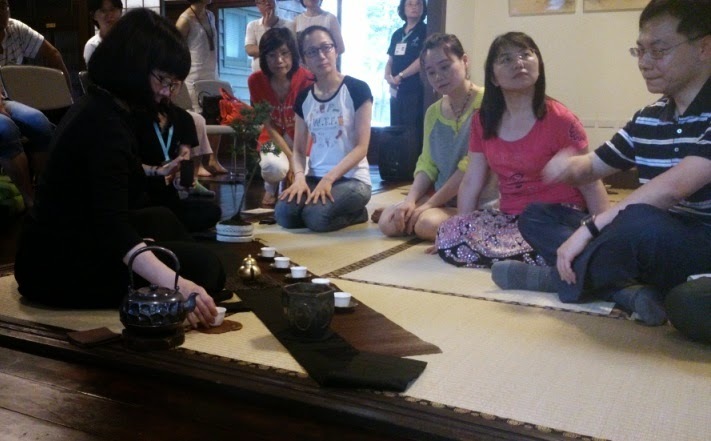 And the cups look familiar: they are Dehua dragon cups! 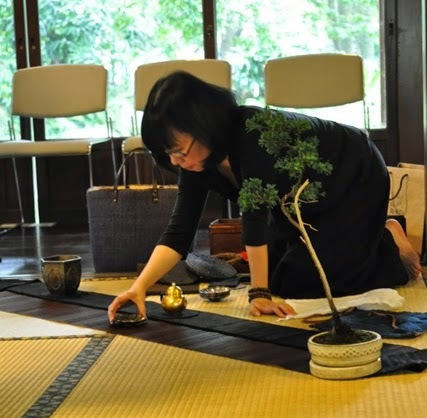 Ms. Jian Toufang installs the third Chaxi next to mine. She's using a white curtain fabric as her Chabu! From a distance, her flower arrangement looks like put in a basket. But the handle we see is actually bended grass! And when I noticed that she didn't have a stand for her kettle, I lent her my white hexagon stand. She would brew a Da Yu Ling Oolong with her zhuni teapot. The last performer, Ms. Wu LiYing, has her own style. Her favorite color isn't hard to guess: it's black. 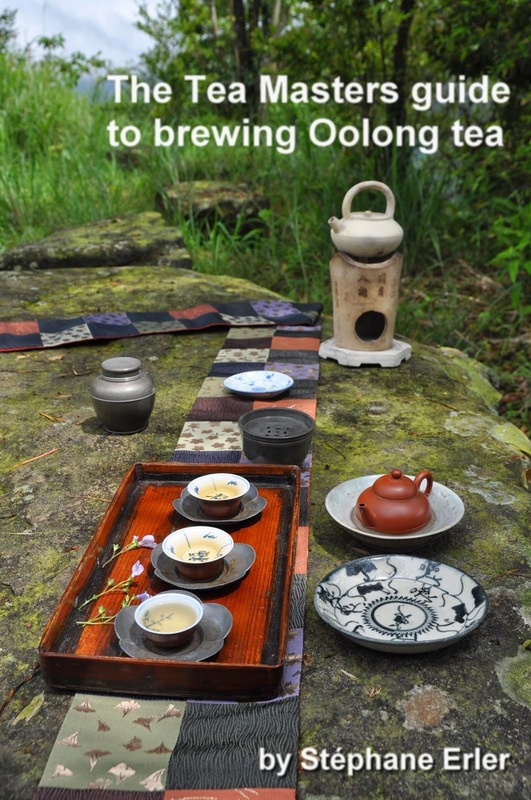 No matter the tea, young or old, fresh or roasted, Oolong or puerh, her Chabu always looks similar. However, for this high mountain Chaxi, she has brought this special bonsai pine tree. On the side, we see that the trunk is white where the bark has been peeled off. This not only creates a stark contrast with the other dark colors, but it reminds me of the white trunk of the often huge pine trees on Da Yu Ling. 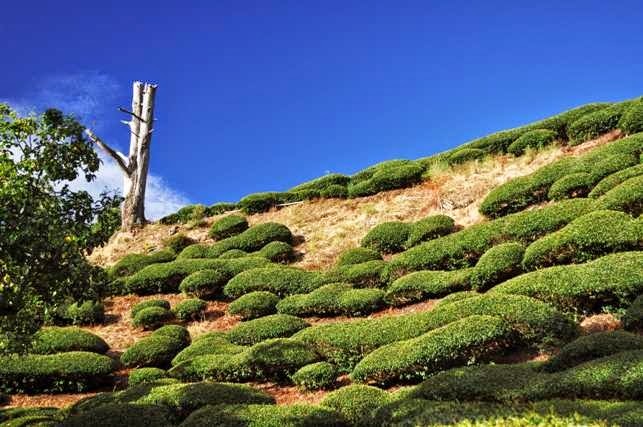 And if her bonsai can remind me of this mountain, then I can almost already feel the powerful taste of this Oolong! Well done! The main attraction of her Chaxi that day is this golden teapot. Actually, it's technically a silver teapot that has been plated with gold! 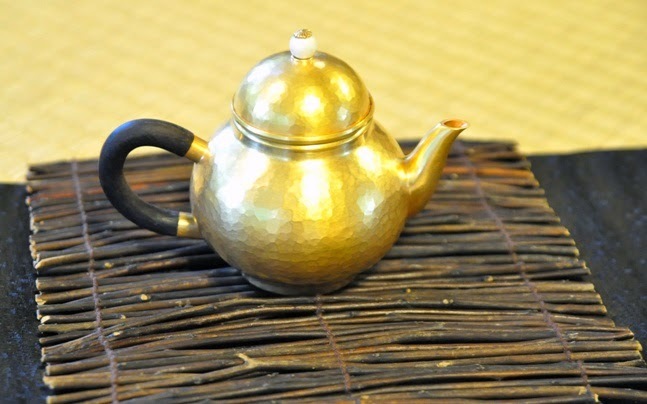 It was recently made by an old Japanese master according to a Chinese teapot design. Such a piece of teaware is very unique and precious! The young lady in the white T-shirt tasted both Da Yu Ling from Ms Jian and Ms Wu. 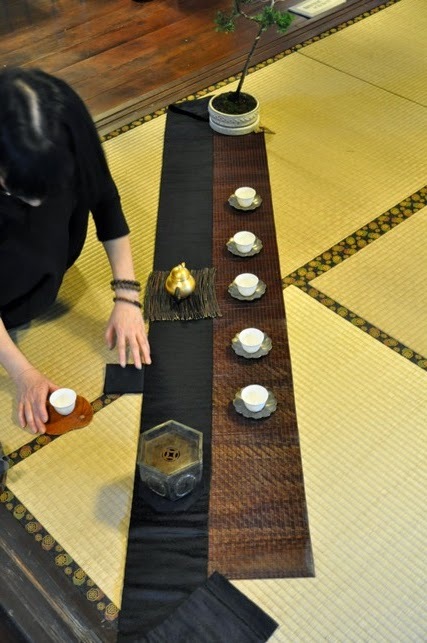 She felt that the tea tasted very differently with the zhuni (water from a tetsubin kettle) and the silver teapot (water from a silver kettle). The zhuni brought more unity and harmony to the taste and the scents. 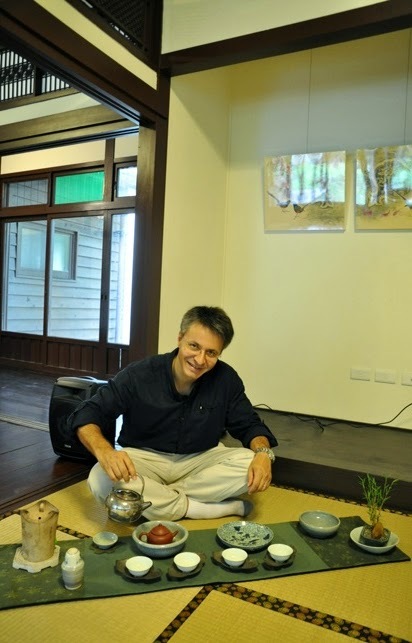 With the silver teapot, the temperature of the tea in the cup was higher. And then the tastes and scents were felt more clearly, each layer of flavors was experienced one by one. 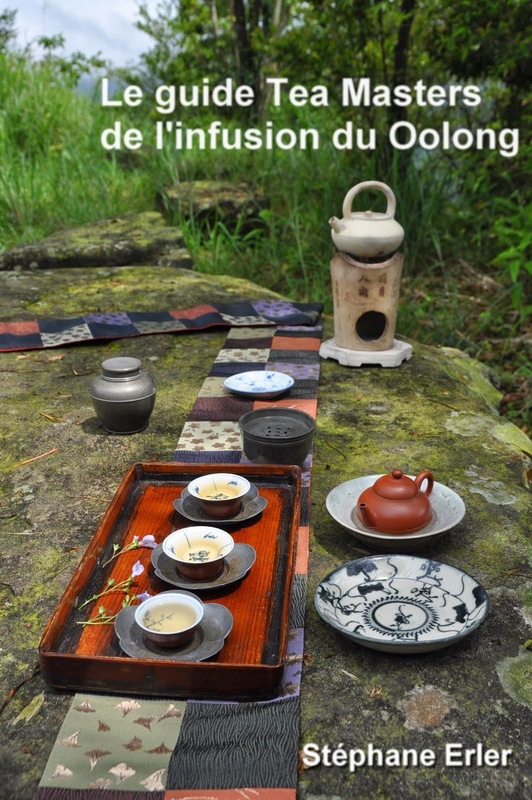 With my Shanlinxi high mountain Oolong, I think that the combination of the silver kettle for very pure and hot water with a zhuni teapot for the harmony of flavors enabled me to get a very powerful, sweet and deep result! 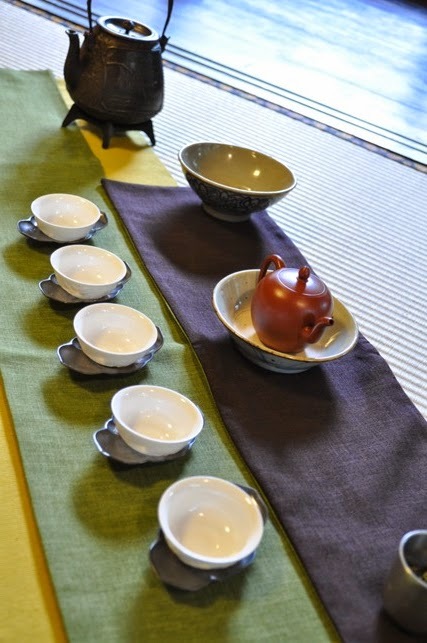 For my Chaxi, I used my light celadon singing cups to emphasize the fresh color of the brew. The celadon bowl by Michel François has some bluish tones and symbolizes the blue sky over the mountains. My little bamboo plant with a stone is another symbol of the vegetation growing on Shanlinxi. All the tea settings are beautiful! Congratulations on 10 years of blogging, that is quite an accomplishment.